Lemons are, in fact, the perfect summer fruit. I know, I know, the mighty pineapple, the delicious nectarine, that kilo of blueberries you accidentally ate in one day because they were so good…but lemon’s where it’s at. Just ask my gin and tonic, or my fish and chips. They’ll both tell you what you already know – nothing goes better with sunshiney rays than the fruit that looks the most like the sun. It’s also, as of now, a big print trend. I was sucked in by this Dolce and Gabbana print (as was the rest of the internet, apparently, as it’s now blimming hard to find this dress). However! I am not in the market for a $$$$$ dress that I can wear only in fantasy walks through the streets of Roma. 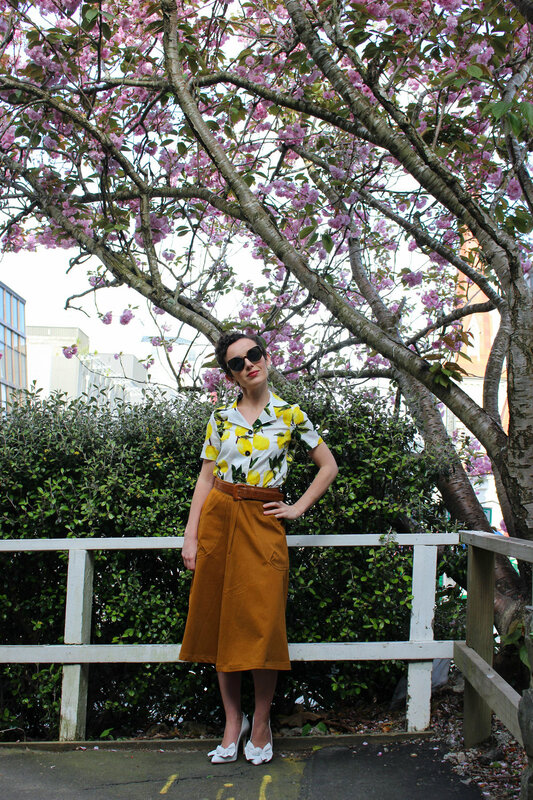 Luckily, I am a creep who tries to find all the Wellington fashion designers she can via the gift to humankind that is Instagram – which is how I came across Cry Cry Cry Clothing. And this shirt. And then I bought it (and featured it in my weekly newsletter – subscribe here!). It is HEART FACE EMOJI, yes? I love the cut of the collar and the dark buttons, I love the print (obviously) and I love that it makes me feel like a photo of my Nana in the 1950s. That’s my vibe, this summer. I’m getting a swimming cap with applique flowers and I’m wearing a lot of cute blouses. The button placement on this shirt is also on point, with the top-most button hitting exactly at the perfect modest-but-not-too-modest point on my décolletage. I’m wearing it here with this skirt and demonstrating a Fashion Trick that I learned years ago in my dark days in retail. This shirt is predominantly yellow, white and green, with very small amounts of this ochre colour in the lemons to give a bit of dimension. It’s super easy to coordinate a print if you wear it against a solid block of whatever colour appears the least frequently in the print. I think it’s because the two items still appear to match, without looking too matchy-matchy…whatever the reason, it worked well here. I brought out a pair of very white heels in this super ladylike style to keep it fresh and summery, but a pair of sandals would be great for low key jaunts about town. I’m yet to see tons of lemon print filter its way down to the high street in New Zealand, so the window of time in which to enjoy this before it becomes over saturated (RIP palm print) is still open. The key is to look for a lemon print that looks painted by some delightful watercolourist – nothing too machine made, or saturated. You might prefer your lemons on a black background, which I’ve also seen around the traps. If you’re good at sewing and want to make me a lemon print dress, I’d mention here that Spotlight has stocked this lemon print fabric in both colourways. 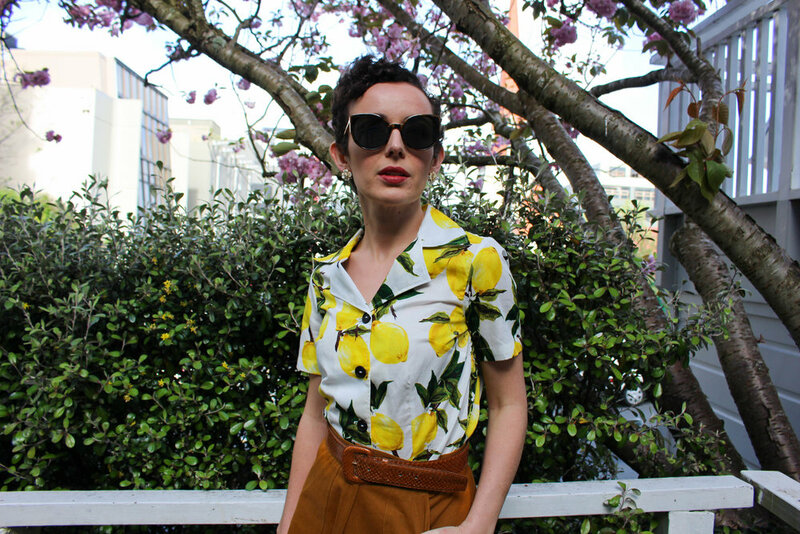 Forget florals this summer and join me in wearing clothes that remind you of the ultimate lesson of lemons: even if you’re a bit sharp for some tastes, you can still be a MVP in the right combination. Shirt is from Cry Cry Cry (not sponsored). Skirt is from MADE Store in Britomart, Auckland. Shoes are Wittner (for those playing along at home, yes I own these in three colours now). Sunnies are from Sunglass Style and earrings are “Chanel” from some dodgy boutique in Left Bank here in Wellington about 8 years ago. Lipstick is Wine with Everything from Revlon.